Want to mark the presence of your pet in the internet ? Create a Facebook profile for him/her! Come on do it quick, this is what people everywhere are doing right now. As a pet owner myself the idea seems fun, but yes in a few days the profile will go inactive. I just came across this article in CNN “People posing, and talking, as their pets on Facebook“. I was surprised at first but then you know people do some crazy stuff when they have access to the internet. The whole thing seems completely pointless. Whats the point in creating a profile for your pet and updating his status on your own ? Lack of friends ? So many questions comes to me when I think about this. How can I approve a friend request if my dog doesn’t approve or like him? Well it does seems fun. 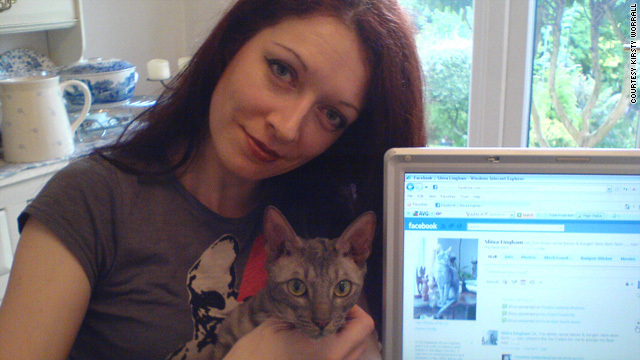 Shiva Lingham(The Cat), Kirsty Worrall(The Human) pose with Shiva's Facebook profile. One thing is for sure, I won’t create a FB profile for my pet. Its like creating a multiple personality for me. US Women Accused of Biting Dog! Previous: How to access two Gmail account at once in the same browser?